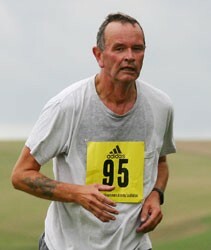 I ran a short distance in the rain yesterday evening for my last run of 2005. It has been a reasonable year for running: two marathons, three half-marathons and a 10K. On the debit side, I was pulled up in the Jog Shop Jog and family things stopped me running in the Lewes Downland 10k and the Mince Pie Ten Mile. For next year, I've entered the Sussex Beacon and Hastings Half Marathons and I hear talk of an Eastbourne half-marathon too. I didn't get a place in the London marathon, so may either enter the Tresco marathon on the same day, or the Three Forts. Post scriptum: the Eastbourne Half Marathon is on 26 February, the weekend after the Sussex Beacon, and two weeks before Hastings. Three half marathons in four weeks? Why not? An icy and snowy run to Firle Beacon, and I was slow, partly because of the conditions, partly because of over-indulgence and I also had some back trouble at the beginning. I passed a pheasant shoot in a valley below me, possibly Greenway Bottom. Away at a friend's 50th birthday party, I ran before dawn on a cold Sunday morning before along the A38. Being at home today, I had time for a longer run, and the sun was shining so I went to Seaford Head, then the length of Seaford Bay as far as Newhaven East Pier; usually if I go this way I run out along the pier for the view back towards Seaford, but it is closed for repairs at the moment.